With the purchase of this unusual, 20.65-carat Fancy Intense Yellow, IF clarity (internally flawless) diamond by C.D.Peacock, Chicago's premier jewelry store plans to try to change the way people in America think about fancy colored diamonds -- many people still don't even know there is such a thing as a fancy colored diamond. According to Ray Perlman, a consultant to C.D. Peacock and former Chairman of the Board of the New York Diamond Dealers Club, most people have no idea that diamonds occur in a color other than colorless (white). Yet, notes Perlman, when asked to identify the world's most famous diamonds, most people will name the Hope Diamond, which is Fancy Dark grayish-blue, and the Tiffany Yellow Diamond, which is golden yellow. It is also true that some fancy colored diamonds have been valued higher than colorless diamonds of the same size. Take for instance the 0.95-carat fancy red round brilliant that set the world record, price-per-carat for diamonds. It went for $880,000 at Christies NYC. That comes to about $926,000 per carat. But then again, red and purple diamonds are the two rarest colors. The stone is now called the Hancock Red. 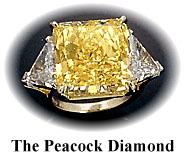 The Gemological Institute of America (GIA) has graded the Peacock Diamond as Fancy Intense Yellow, a designation limited to a very small percentage of the yellow diamonds. The natural, internally flawless stone is radiant cut, which is similar to princess cut, but rectangular with cut corners, and slightly more sparkle. The stone measures 15.62 × 14.49 × 9.37 mm, and weighs 20.65 carats. This unique diamond is flanked on each side by modified triangular-cut diamonds mounted in platinum and 18K gold. "Diamonds like this one are extremely rare and when these gems change hands, the sales are often veiled in secrecy," says Perlman. "It is estimated that nature creates so few fancy diamonds that they account for less than 1% of the diamonds offered for sale at any given time." When these exceptional diamonds do change hands, the sale often becomes international news. In March 1997, jewelry from the estate of Hollywood legend Claudette Colbert was auctioned at Christie's, Los Angeles. An important fancy intense yellow and near clear colorless diamond pendant, originally estimated at $60,000 - $80,000 was sold for $277,500. Two months later, in May 1997 a 13.83-carat fancy yellow vivid diamond was sold at Sotheby's, New York, for an auction record for fine yellow diamonds of $3.3 million ($3,300,000.00), or approximately $239,000.00 per carat. The previous record of $202,000 per carat had been set in London in 1990 for an intense yellow diamond. Although most jewelers never have the opportunity to offer fancy colored diamonds to their customers, the chic, jet set seeks them out. For example, Jerry Seinfeld selected a 4-carat yellow diamond (which was said to have carried a $200,000 price tag) for his fiancee. Fancy colored diamonds are frequently the choice for 'encore brides', special anniversary celebrations, and, of course, just because they are so unique. Most people still prefer colorless diamonds, and often, as strange as it may seem, this is because they don't know that colored diamonds even exist. Perlman adds, "Fancy colored diamonds, while extremely rare, are still attractively priced because they are so new to the market. Only a very select group of people have ever had the chance to see one and few are aware of their value." Colored diamonds have traditionally been more popular with astute consumers and investors outside of the United States. In recent years, however, they have come to the attention of knowledgeable jewelers, collectors, and trend spotters in the United States who have watched these stones continue to increase in value. The Peacock Diamond will be on display at C.D. Peacock, Northbrook Court, Chicago, along with other rare fancy colored diamonds, fine and antique jewelry and unique accessories. C.D. Peacock also features a prized Norman Rockwell original oil, The Jeweler, which was originally commissioned by the Swiss Watch Association in the 1930's, and a private collection of Tiffany glass and decorative arts.